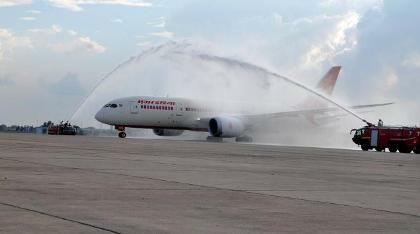 Indian airline carrier Air India has decided to resume domestic operations with the Boeing Dreamliner aircraft as early as next week. The aircraft were grounded for about four months due to a battery problem and the company has replaced the old batteries with the newly leased ones. Sources from the airline said that the Air India board had met and was briefed about the progress of making changes in the batteries of the six Boeing 787 Dreamliners, which are owned by Air India. The first domestic flight will take place next week, after being replaced with a new package of lithium ion batteries. Some sparks in the battery of two of the aircraft owned by the Japanese airlines had led to the grounding of 50 Dreamliners worldwide in the month of January 2013. The board has decided to replace 14 Air India owned and 5 leased aircraft, which were 20 to 22 years of age. The leased aircrafts would be then returned to the lessors and the ones which were owned by Air India would be phased out gradually. The process will begin by the third quarter of this financial year and would require about 10 to 12 months to be complete.